“By basing the carnival in Melbourne we are able to engage with the broader football community including the AFL, VFL and suburban leagues. “We look forward to welcoming countries from Oceania, North America, Europe, the Middle East, Asia and Africa. While the countries have various playing standards and local development programs, the common denominator is all the participants share our love of playing our great game,” he said. 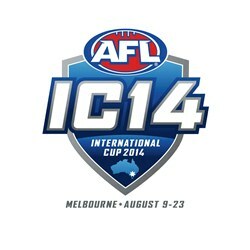 The International Cup is a feature in the AFL International calendar and plays a role in supporting the growth of AFL internationally. The concept grew from the passion of committed individuals from both Australia and abroad following successful smaller carnivals with international participation. The International Cup is played every three years. No expatriate Australians are eligible to play. Teams comprise solely of amateurs who must be nationals of the country they represent. The International Cup has significantly grown from the first carnival in 2002 where 11 countries competed. In 2011 there were 23 teams - 18 men's teams across two divisions and five women’s teams that traveled to Sydney and Melbourne. 2011 Men’s teams: Canada, China, Denmark, Fiji, France, Great Britain, India, Ireland, Japan, Nauru, New Zealand, Papua New Guinea, Peace Team, South Africa, Sweden, Timor-Leste, Tonga and USA. 2011 Women’s teams: Canada, Ireland, Indigenous/Multicultural, Papua New Guinea and USA. I wonder whether the "matches linked with community leagues" is having the different nations play a "warm up" match with a "host" club as I suggested before the last IC. Could see a lot more spectators(host club members supporting their adopted nation) at the Cup matches themselves????? Collectively that could amount to several hundreds more spectators than the last IC. Wouldn't that be good for the event? Sponsors???? AFL Europe has managed to get a sponsor for the Euro Cup 9's for the next few years, wonder why AFL not managed to get a sponsor for IC yet? European championships this year probably a little too close to get a sponsor for, but IC next year and the international matches played around the world and next European Championships would bring a lot of exposure for any prospective sponsor surely.